Civilisation de l'Afrique Centrale) founded. of the Congo recognized by Berlin Conference. 15 Nov 1908 Annexation by Belgium (Belgian Congo). 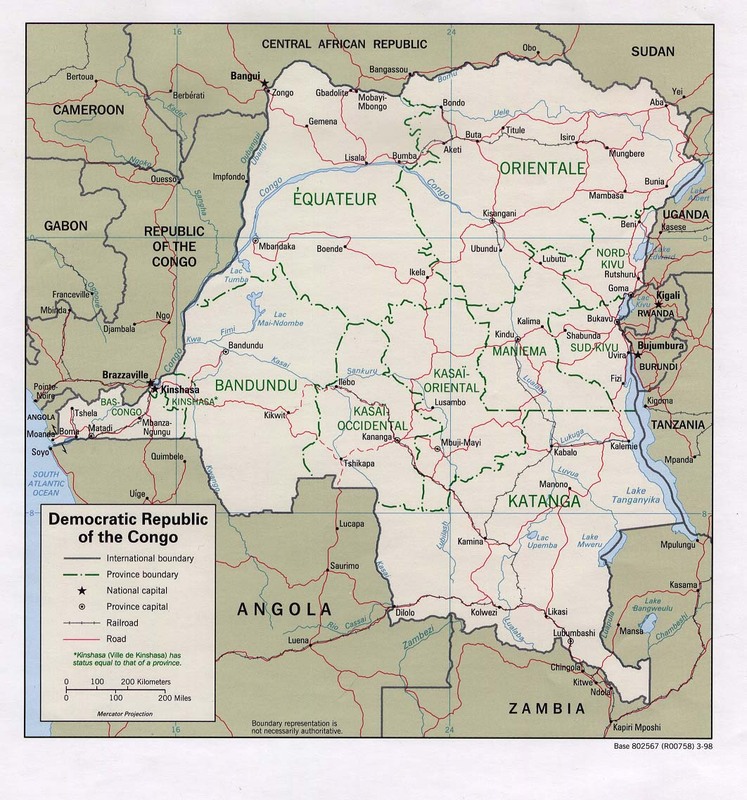 11 Jul 1960 - 14 Jan 1963 Secession of Katanga. 2 Aug 1998 - 2 Apr 2003 Rebellion in eastern Congo led by RDC (see below). ¹Style of the ruler 29 May 1885 - 15 Nov 1908: Souverain de l'État Indépendant du Congo ("Sovereign of the Independent State of the Congo"). Normally as part of the executive formula: Léopold II Roi de Belges, Souverain de l'État Indépendant du Congo ("Léopold II King of the Belgians, Sovereign of the Independent State of the Congo"); also in official use as a term of reference to the holder of the office: Roi-Souverain. ²President Kasavubu dismissed Prime Minister Lumumba on 5 Sep 1960 and appointed Iléo in his place, but this was not recognized by parliament and Lumumba continued as prime minister of a rival government until 14 Sep 1960. 3Regarding the appointment of Birindwa as illegal, Tshisekedi continued as prime minister of a rival government into 1994. Tshisekedi had already been effectively suspended on 11 Dec 1992, when President Mobutu named Nicolas Zushi Mupiemina as chairman of a Board of Secretaries-General to take over coordination of the government. Territorial Disputes: Heads of the Great Lakes states and UN pledged in 2004 to abate tribal, rebel, and militia fighting in the region, including northeast Congo, where the UN Organization Mission in the Democratic Republic of the Congo (MONUC), organized in 1999, maintains over 16,500 uniformed peacekeepers; members of Uganda's Lords Resistance Army forces continue to seek refuge in Congo's Garamba National Park as peace talks with the Uganda government evolve; the location of the boundary in the broad Congo River with the Republic of the Congo is indefinite except in the Pool Malebo/Stanley Pool area; Uganda and DRC dispute Rukwanzi Island in Lake Albert and other areas on the Semliki River with hydrocarbon potential; boundary commission continues discussions over Congolese-administered triangle of land on the right bank of the Lunkinda River claimed by Zambia near the DRC village of Pweto; DRC accuses Angola of shifting monuments. at Stanleyvile in eastern provinces. government of Laurent Kabila, aided by Rwanda and Uganda. 23 Aug 1998 Rebels and Rwandans seize Kisangani. beat back the rebels and their allies from the capital city. Rwanda refuse to be bound by the agreement. and RCD-G (31 Aug 1999), it fails to stop the war. Democratic Republic of Congo (MONUC)(deployed in 2000). 17 Jan 2002 Mount Nyiragongo volcano erupts devastating large swathes of Goma. 6 Sep 2002 Luanda Agreement signed by Uganda and Congo. Oct 2002 Rwanda forces withdraw from eastern Congo. Angola withdraw from the Congo. 31 Dec 2002 Gbadolite Agreement signed by MLC, RCD-ML and RCD-N.
the civil war. Ugandan forces withdraw in May 2003.
in imposing their power in large parts of eastern Congo). 1884 Agreement dividing the region between the two powers reached. of the Congo Free State. creation of the Arab Military Territory. ¹the term "Arab" was used by Belgian colonial historiography to designate these eastern communities, but this is not fully correct, although there were some Arabs among their members -and even some Indians -most were of East African Swahili origin. The most important vassals of Rashid bin Mohammed in c.1892 were: Bwana N'Zige ("brother" of Tippo-Tip) in Kabambare, Gongo Lutete in Ngandu (b. 1860 - d. 1892), Kibonga-Longo ain Mawambe, Kibonge in Kirundu, Mohammed bin Hassan "Rumaliza" in Ujiji (b. 1850 - d. ....), Mserera in Riba-Riba, Munia Muhara in Nyangwe, Sefu ("son" of Tippo-Tip) in Kasongo (b. 1860 - d. 1893). the Sultanate - he acted mostly independently.